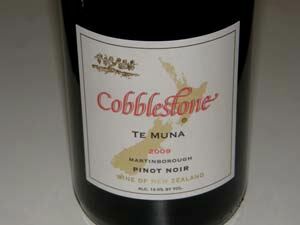 Cobblestone Vineyards in Napa, California had the inaugural release of a Martinborough, New Zealand Pinot Noir from an estate vineyard in 2009 causing a sensation by receiving "Wine of Show" trophy at the 2010 Romeo Bragato Wine Awards in New Zealand. Cobblestone produces single-vineyard wines solely from family estates, including Cabernet Sauvignon from Atlas Peak and Chardonnay from Arroyo Seco in addition to the New Zealand Pinot Noir described above. The winery was launched by Saul and Anita Levine who grew grapes for premium California wineries for over 30 years, until 2004 when they released their own wines under the cobblestone label. The winemakers are Sam Baxter in California and Outi Jakovirta in New Zealand. The wines are sold through the website with some retail distribution. Sign up for the mailing list to receive offerings and newsletter.